Both of these titles can serve as a caveat to librarians who are likely to purchase poorly-researched and poorly-written cookie-cutter books in order to serve the needs of homework-driven students. All of the volumes in the Twenty-First Century’s “Dictatorships” series highlight “nondemocratic forms of government.” In each volume, the bold, blocky design consists of jarring red, black and olive graphics that surround mainly black-and-white photos. On the cover of each is a color photo or artistic rendition of the individual “dictator”—except for Fidel Castro’s Cuba. Here, the cover represents Fidel by an ominous black silhouette; the book is, indeed, the shadow of Fidel as seen from the myopic view of the world according to the Cuban exile community in Miami. The narrow focus of this series is basically on the political actions of a particular individual—the one person who embodies the “dictatorship”—rather than on a particular country’s larger social-historical and economic issues. This limited construction ignores forms in which dictatorships often take place. There are no such books about countries with a succession of faceless military dictators, such as in Argentina (although, who can forget Juan Peron?) or Guatemala; neither are there any about countries with a sham democracy run by an oligarchy that enforces its rule through a violent paramilitary force, such as in El Salvador. In Fidel Castro’s Cuba, Markel demonizes Fidel, a populist whose government, in effect, changed the lives of almost all of the people for the better. But here, readers see only the repression and not his economic projects, not his literacy projects, and certainly none of the other reasons that make a revolution necessary. And in Augusto Pinochet’s Chile, Childress doesn’t discuss the fact that he brought about economic “reforms” by privatizing industry because his international funders sought to use Chile as a laboratory for Milton Friedman’s free-market theories. Pinochet’s military dictatorship controlled the people so this privatization could take place. Neither of these two books strays far beyond the political actions of the “dictators”: emphasized are their violations of civil liberties; deemphasized or left out entirely are their economic policies. 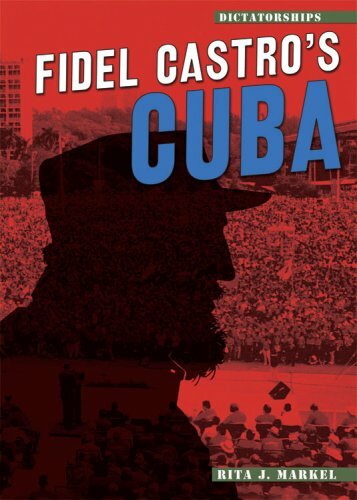 Markel’s conspicuous lack of objectivity paints Fidel as a megalomaniacal tyrant and “Castro’s Cuba” as a harsh and oppressive political system, a police state that follows the every move of the people and imprisons anyone who dares to disagree with anything. It’s the kind of tirade against the Cuban people that could have been written in the big bad Red Scare days, and Markel’s revulsion of Cuba’s political ideology and practice is palpable. She doesn’t stray for a paragraph from the US government’s policy; rather, in every case, she extols it. In truth, from the very beginning of the Cuban revolution, Fidel wanted détente with the US. In 1959, favorable articles about him appeared in Reader’s Digest, Newsweek, Look, and other print media. It was when he began to nationalize the vast holdings of the US corporations that had been one of the causes of the Cuban people’s impoverishment (the other was the rapacious economic policies of the dictator Fulgencio Batista), and when he announced that the new Cuba was a socialist country, the US struck back with its vindictive embargo. These are wonderful things we’ve achieved in Cuba. This government knows how to help business, to encourage it.… Now we have what we have always needed, real partnership with a government.… Gentlemen: Rebels and petty criminals are Cuba’s past. We are its future. Then there are the photos: On page 92 there’s a photo of eight armed men, meeting on a beach. The original Getty Image’s caption, dated March 1, 1963, reads: “Alpha 66, anti-Castro Cuban group.” Yet, Markel’s caption reads: “An anti-Castro group, Alpha 66, meets on a Cuban beach in 1963. Castro quickly cracked down on dissident groups such as this one.” Alpha 66 was not a “dissident” group. It was—and is—a paramilitary organization, financed and trained by the CIA. In July 1959, US planes napalmed the Cuban sugar-cane fields. In January 1960, two planes coming from Florida bombed Havana suburbs. After a year of bombings, sabotage, and economic aggression against Cuba, the US, while continuing to finance terrorist attacks on the island, declared an embargo on all trade with Cuba. As early as 1960, Castro felt it necessary to recruit people to watch and report to the government any of their neighbors who did not support the revolution…. The neighborhood-spying network developed into the Committees for the Defense of the Revolution (CDR). Based on its reports, Castro’s authorities picked up many citizens for questioning by police. Some were imprisoned. In a sidebar entitled, “Health Care in Cuba,” Markel bases all of her information on an opinion piece in The New York Times excoriating both Michael Moore’s POV documentary, “Sicko,” and the Cuban health care system. This piece quotes a doctor who defected in 2000, saying that decent health care is “not available to average citizens” because “most hospitals and clinics lack basic medicines and equipment.” In fact, Cuba has the highest percentage per capita of doctors in the world and thousands of Cuban doctors work for free throughout Latin America and Africa. In the days after the disastrous Hurricane Katrina hit New Orleans, for instance, Fidel offered to send 1,100 English-speaking doctors and tons of medical supplies to help the victims. The US rejected this generous offer and, of course, Markel fails to mention it. Years ago, I saw a photo of a slogan painted on a street wall in Havana, a quote from one of Fidel’s speeches. It said, “Todas las noches, de 30 millones de niños duermen en la calle. Muchos de ellos viven en los Estados Unidos. Ninguno de ellos vive en Cuba.” (“Every night, 30 million children sleep in the streets. Many of them live in the US. None of them live in Cuba.”) In Cuba, everyone has access to free health care. Everyone has access to free education, from grade school through graduate school. Everyone has a place to live. Everyone has enough food. Fidel essentially took a US colony and transformed it into a self-sufficient country. Because of the popular support for the social revolution called “Fidelismo,” for more than 50 years, the Cuban people have successfully maintained their independence and sovereignty, repelling the efforts of the US to interfere in their internal affairs. The revolution bestowed on Cuba extraordinary gifts of social justice and equality, advances in public health and education, and an equitable distribution of the national wealth, and Fidel Castro deserves total credit for it. Although Fidel is a populist, Augusto Pinochet was not. Rather, he encouraged people to inform on their neighbors; while there was no mob violence, there was certainly military violence, including thousands of tortures, murders and disappearances. When Dr. Salvador Allende campaigned on a socialist platform that included the end to unlimited foreign competition and unequal distribution of wealth, he became the first democratically elected Marxist president of a Latin American country. After Allende’s electoral victory in 1970, he nationalized the banks, mines and strategic industries; broke up large rural estates into smaller communal farms, and instituted strict price controls. The CIA, after having failed to prevent Allende’s election, jumped in to destabilize Chile’s economy. In less than a year, strikes and sabotage by the far-right Patria y Libertad, a paramilitary group funded by the CIA and supported by right-wing students and elements of the middle-class, had created economic and social chaos. On September 11, 1973, Augusto Pinochet and his armed forces overthrew the government, bringing with them terror, murder, torture, repression, and economist Milton Friedman’s experiments in free-market forces and monetarism. Months before the coup, Pinochet and his team of technocrats, many of whom had studied under Friedman, had put together a plan to overhaul Chile’s economy. The overhaul included removing trade barriers, privatizing state-owned industries, establishing a central bank to control interest and exchange rates, drastically cutting wages, and privatizing the social security system. The repression, enforced by military terror—including the banning of labor strikes and unions—allowed the free-market policies to take hold in a way that a democratic process never could have. Indeed, the growth of Chile’s gross domestic product came at the cost of the murder, torture, and disappearance of more than 28,000 Chileans. Allende was no fool. In his last speech to the Chilean people, moments before his death, he laid the responsibility where it belonged: “At this definitive moment,” he said, “the last moment when I can address you, I wish you to take advantage of the lesson: foreign capital, imperialism, together with the reaction, created the climate” for the army to break with tradition and bring about the coup. On September 15, 1973—just four days after the coup d’état—the Chilean military publicly tortured and then machine-gunned Victor Jara to death in Santiago’s boxing stadium. The 40-year-old Jara, a Chilean teacher, poet, singer-songwriter, and political activist, had been one of the founders of the Nueva Canción Chilena (New Chilean Song) movement; and his music—including the stirring “El Derecho de Vivir en Paz” (“The Right to Live in Peace”)—played and continue to play a powerful role throughout Latin America in the struggle for human rights. Victor Jara’s life and music have been memorialized in recordings, tribute albums, documentaries and films, yet there is no mention of him in Augusto Pinochet’s Chile. In 1975, a US Senate investigation directly linked Pinochet’s coup to the CIA. It’s well known that, since the early 1950s, covert CIA involvement in military coups throughout Latin America—including training, financing and outright direction—have been proven. Yet both Markel and Childress downplay or rationalize the role of the CIA—or leave it out altogether. 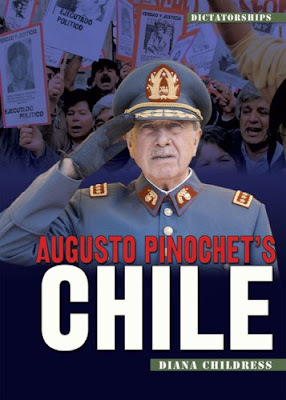 In September  the murder of former Chilean ambassador Orlando Letelier, and his assistant, Ronni Moffitt, in Washington, D.C., further aroused anti-Pinochet sentiment. Even in the context of “the [Church] committee’s findings about secret CIA attempts to control Chilean politics between 1963 and 1973,” there is no mention of even the tacit approval of the US in Letelier’s and Moffitt’s murder. For the past 66 years, the School of the Americas (SOA)—located at Ft. Benning, in Columbus, Georgia, and funded with US taxpayer dollars—has been dedicated to educating soldiers from all over the Western Hemisphere on the arts of explosives and sabotage, torture and murder, kidnapping and disappearing innocent civilians, and sometimes wiping out whole villages. Upon graduation, SOA cadets return to their home countries and quickly become members of secret police or death squad units. SOA, which has been renamed the “Western Hemisphere Institute for Security Cooperation (WHISC)” and still referred to as “School of the Assassins,” has graduated more than 65,000 soldiers from 18 countries, including Chile, El Salvador, Bolivia, Guatemala, Argentina and Colombia. One out of every seven members of the command staff of DINA—the notorious Chilean intelligence agency responsible for many of the worst atrocities committed during the Pinochet years—was a graduate of the School of the Americas. Yet Childress does not even mention SOA in Augusto Pinochet’s Chile. The short story is this: Any Latin American leader who goes after the oil companies, the mining companies, the global bankers, and the other vested interests—quickly winds up on the US hit list. In Cuba, Fidel was messing with US economic interests on the island, and the US has been trying to get rid of him for more than 50 years. In Chile, Allende was messing with US economic interests as well, and the US got rid of him and replaced him with Pinochet. This is what both Fidel Castro’s Cuba and Augusto Pinochet’s Chile distort in Lerner’s “Dictatorships” series. Neither is recommended. The other titles are Than Shwe’s Burma, Pol Pot’s Cambodia, Mao Zedong’s China, Saddam Hussein’s Iraq, Muammar Al-Qaddafi’s Libya, Kim Jong Il’s North Korea, Slobodan Milosevic’s Yugoslavia, and Robert Mugabe’s Zimbabwe. In cases where the author or other source refers to Fidel Castro by his full or last name, I do the same as well. In other cases, I refer to him as “Fidel,” because that’s what the Cuban people call him. From the perspectives of her predominantly right-wing sources, Markel tells the story of Fidel’s rise to power and his oppression of the Cuban people. For an excellent documentary about the Cuban health care system, see “Salud!” (www.saludthefilm.net). According to UNICEF (http:///www.unicef.org/infobycountry/cuba_statistics.html), Cuba’s literacy rate is 100%. In a 1983 ABC-TV program including an interview with Barbara Walters, Fidel made an unannounced visit to a high school in Havana, where he received a rock-star welcome, especially from the girls. CIA involvement includes: Guatemala (1954), Guyana (1953-64), Cuba (1959-present), Ecuador (1960-63), Brazil (1961-64), Dominican Republic (1963-65), Uruguay (1964-70), Chile (1964-73), Bolivia (1964-75), Argentina (1975-83), Nicaragua (1978-90), Honduras (1980s), Grenada (1979-83), El Salvador (1980-92), Haiti (1987-94), Panama (1989), Mexico, Colombia and Peru (1990s-present), and Venezuela (2002). As of this writing, Argentina, Bolivia, Brazil, Uruguay and Venezuela have elected leftist governments. The CIA often operates abroad under USAID cover. Costa-Gavras filmed “State of Siege” in Allende’s Chile in 1972. Ten years later, he filmed “Missing,” a drama based on the true story of the abduction and murder of American journalist Charles Horman in the bloody aftermath of the Chilean coup. “Missing,” which starred Jack Lemmon and Sissy Spacek, was banned both in Chile and in the US until 2006, when it was re-released. One of the most notorious of DINA’s “interrogation centers” was at Villa Grimaldi, a mansion in Santiago. An excellent documentary about the savagery practiced there is “Villa Grimaldi: Archeology of Memory” (www.archeologyofmemory.org), by Chilean artist Quique Cruz, one of those tortured who survived.